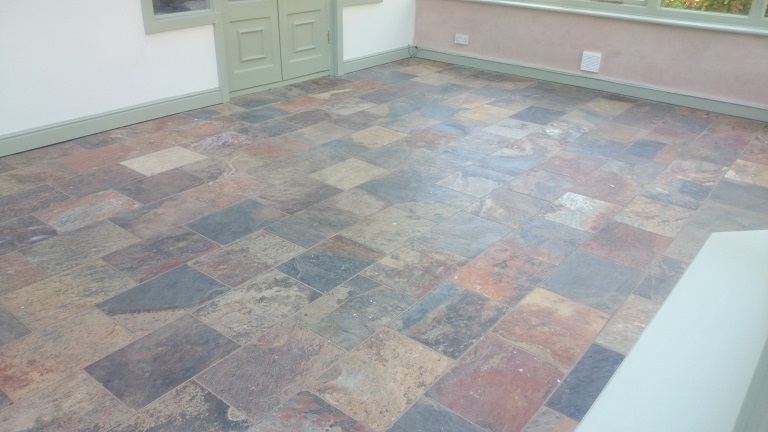 Common Problems with Slate Flooring: Dirty, Dull, Slate Delamination Splitting / Lifting, Lighter colour in some areas. 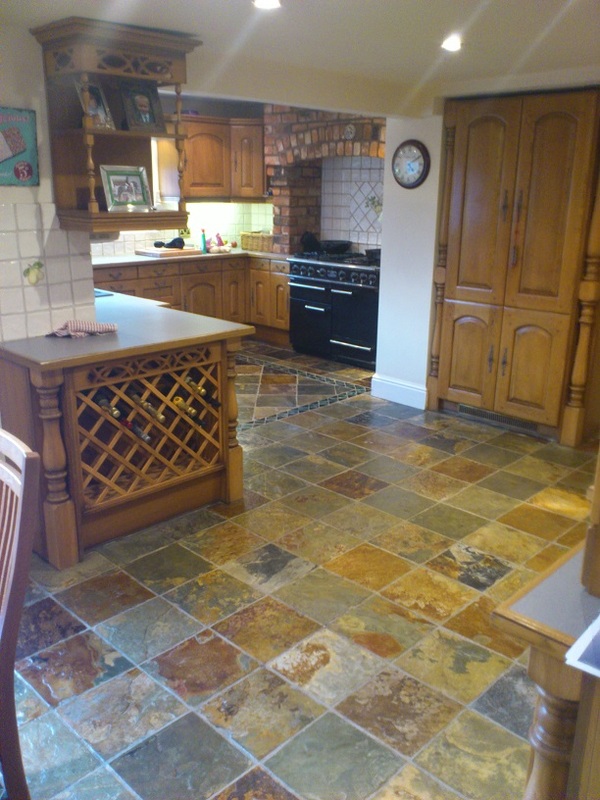 Slate is very different from the other Natural Stones like Marble, Travertine and limestone. It’s make up means top of the slate surface can lift or split which is called delamination, it is also prone to looking dull or matt and light / white patches can appear. 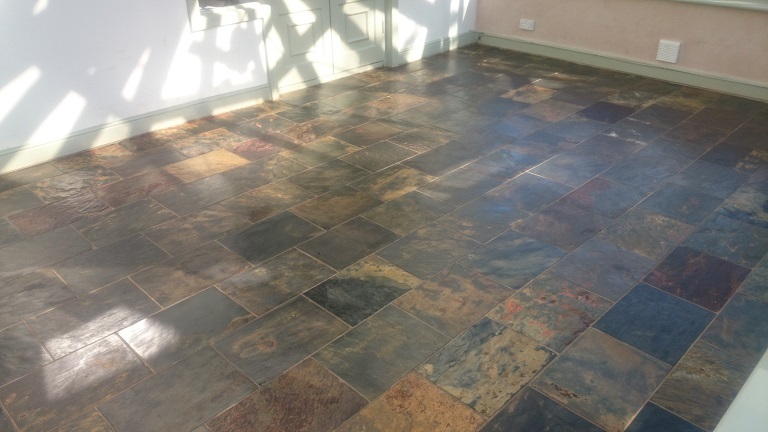 Above is a coloured slate floor, which was dull and in need of restoring, after cleaning it was sealed with a Slate Seal which prevents delamination. 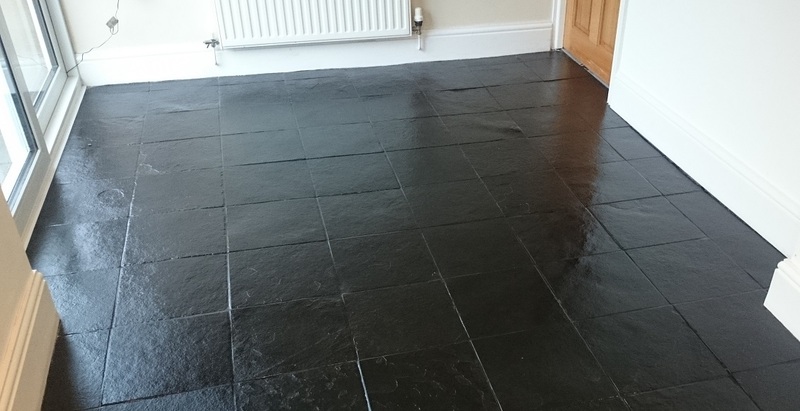 Above is a black slate floor which was newly laid however it had not been sealed and building work meant the floor was dirty and unprotected. After a deep clean it was sealed with a high gloss specialist slate seal to protect it and give it that dark gloss look the customer wanted. Above are images of a slate restoration. The floor had never been sealed and was hard to maintain, once cleaned it was sealed with a low shine seal, in the last picture the floor is still drying after sealing. Slate can be cleaned using the right slate cleaner, this will ensure the top of the stone is free of dirt and debris returning it back to its original colour. 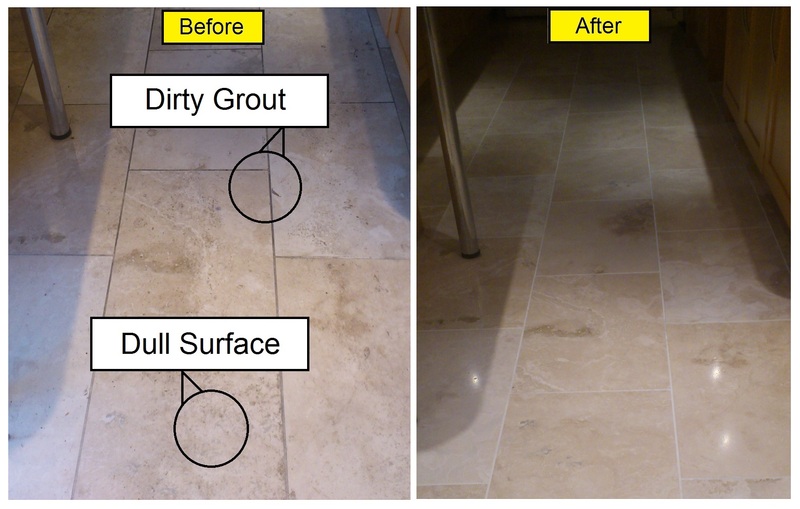 Cleaning can also remove the light / white areas of the stone can suffer from. More than any other stone the correct seal will make the biggest difference and bring the true beauty out once more. 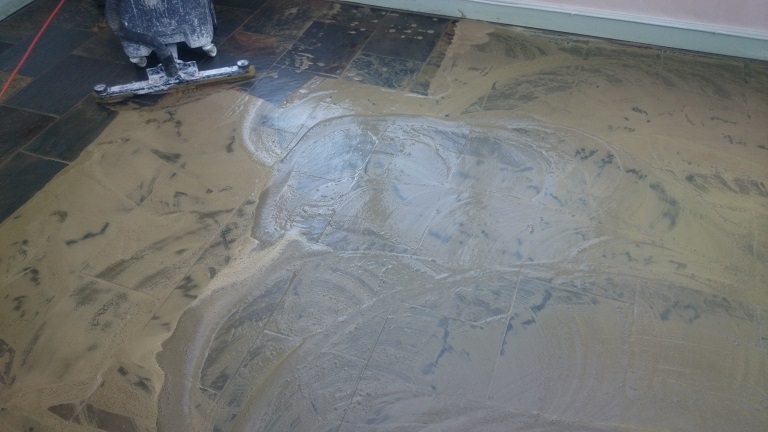 Although it cannot be polished like other stone a diamond pad can be used to help remove debris and return the surface of the stone back to how it should be. Repairing: Slate by its nature will have areas which lift or split from the surface of the stone, the right seal will help prevent this. In some cases it can be filled to prevent this or fill a whole or area which is damaged, this is normally only done in small areas. 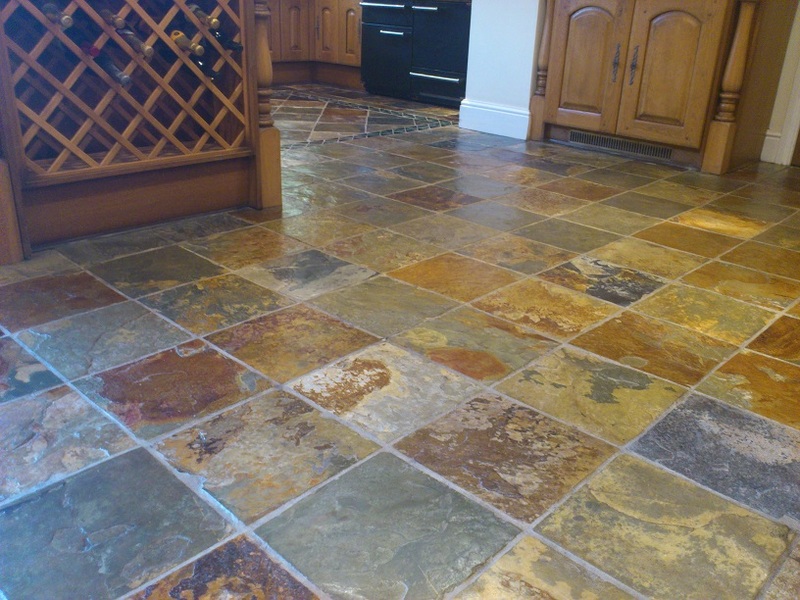 Most commonly Slate is sealed with a high shine or wet look seal which enhances the colours in the stone. It can also be finished to a matt or honed finish. As mentioned a number of times above using the RIGHT seal for Slate is the most important part of the restoration and care procedure. It will help prevent parts lifting from the surface as well as keeping it clean for longer. The most impressive aspect of the right seals is the colour intensifying aspect, the colours look bright and beautiful. Use the wrong seal at your peril! 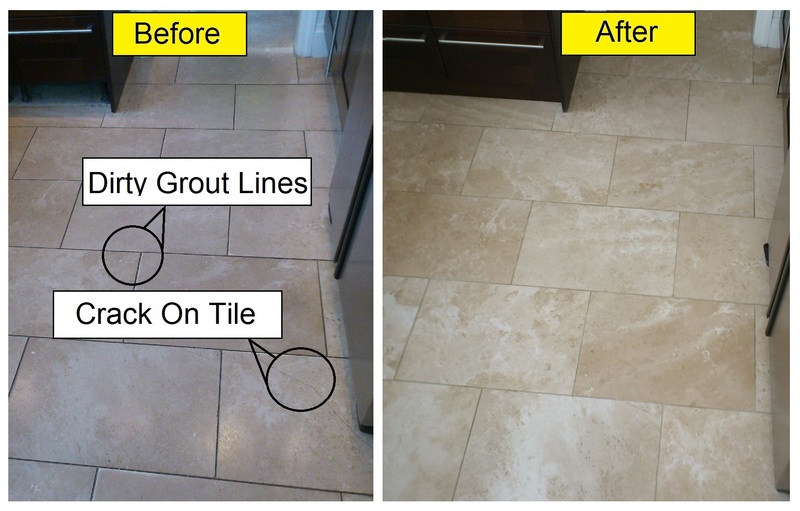 Why Use Bond & Sons, Stone Floor & Tile Cleaning For Your Slate? Simple, experience and the right process. 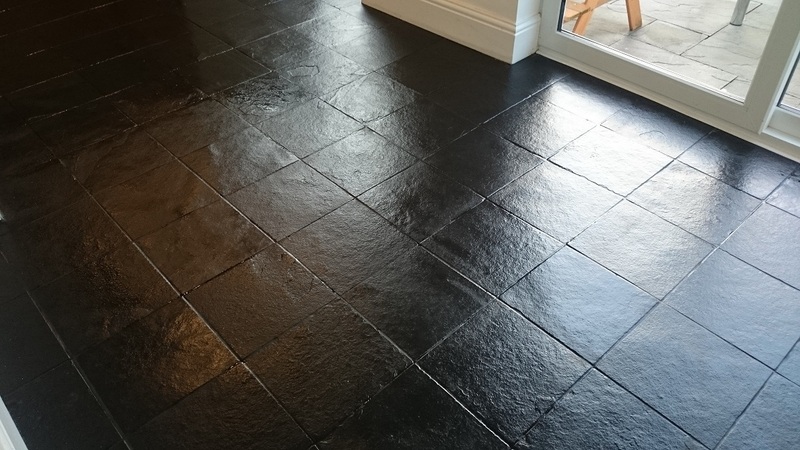 Bond & Sons have developed their own process which brings your Slate flooring back to life and will keep it that way for longer. They are not franchised, tied to any one process, system or supplier so they get the right mix of the best ingredients to ensure the work is carried out to get the best results. Slate is widely quarried famously in Wales however it is found throughout the world. Slate comes in many different colours and has a variety of uses from writing on to roof tiles, flooring, worktops and other ornamental and structural uses.